A 42-year-old woman was admitted through our emergency department for subacute onset of lower abdominal pain in September 2014. Bedside ultrasound by a gynaecology specialist showed a left adnexal cyst with fluid interface. 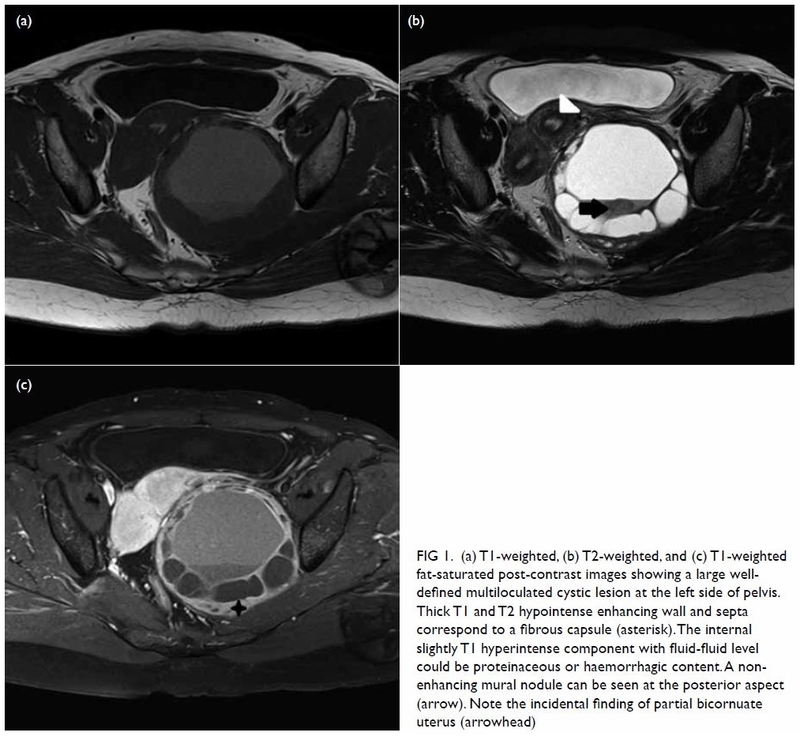 Magnetic resonance imaging of the pelvis showed a large well-defined multiloculated cystic lesion measuring 9.2 cm (width) × 8.5 cm (depth) × 8.9 cm (height) with thick T1 and T2 hypointense enhancing wall and septa at the left side of the pelvis (Fig 1). An internal slightly T1 hyperintense component with fluid-fluid level was suspected to be proteinaceous or haemorrhagic content. A 1.6-cm non-enhancing mural nodule was noted at the posterior aspect. Partial bicornuate uterus was noted. Bilateral ovaries were normal in size with small cysts (Fig 2). Laparoscopy was done, with excision of the lesion. Intra-operative frozen section showed a benign spindle cell tumour. Final histopathological evaluation revealed a retroperitoneal schwannoma. The majority of cystic pelvic masses originate from the ovary. Mimics of ovarian cystic masses have a wide variety of diagnoses. It is important to understand the relationship of a mass with its anatomic location, identify normal ovaries at imaging, and correlate imaging findings with the patient’s clinical history to avoid misdiagnosis. In the present case, the patient did not complain of any neurological symptoms at presentation. The presence of normal ovaries and fibrous capsule indicated a preoperative diagnosis of ancient schwannoma. This case illustrates the importance of considering this uncommon diagnosis when a pelvic complex cystic lesion is detected in imaging, and seeking specific imaging features (such as fibrous capsule and close relationship to the nerve) to confirm or exclude this diagnosis. This would facilitate surgical planning and minimise the risk of complications such as major neurological deficit. All authors contributed to the concept or design, acquisition of data, analysis or interpretation of data, drafting of the manuscript, and critical revision for important intellectual content. All authors had full access to the data, contributed to the study, approved the final version for publication, and take responsibility for its accuracy and integrity. All authors have disclosed no conflicts of interest.